There is 1 review for 'Revenant Saga'. An updated twist on a classic feel. This is my second review on this site (first was Alvastia Chronicles). I will mention the pros and cons, as well as what I got out of the game. I would like to point out that Revenant Saga was the third Kemco game I’ve played. Enjoy a wonderful adventure-filled world with tons of collectibles, challenges and immersive game play. 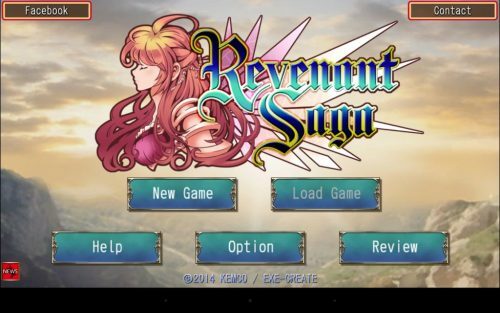 Revenant Saga, much like many other Kemco titles, has a lot to do in-game and post game. You will discover lots of treasure chests and rare enemies while battling your way through a beautifully constructed land. The in-battle graphics were mind blowing as I was not expecting that feature at all. The maid system is high functioning and gives you many goals with great rewards. While in battle, you will have the option to use the “Transform” feature to utilize specific abilities that are restricted otherwise, and the “Burst” feature that kicks in once in a while between commands to punish your foes as it also makes for high combo counts and damage. The skill setup is pretty good and gives each character a decent variety of commands- assisting your rise to victory. I found that although the game would lag and/or freeze here and there, accepting the issue was worth it as the game throws you all kinds of ways to keep you interested. Often, you will come across many challenges and really tough enemies that punish you will a salvo of powerful abilities. I highly recommend you do some early game level grinding with the assistance of the “Shop” menu. Revenant Saga is considered a mildly-lengthy game to many of the later generation of gamers. If you wish to collect everything, expect to spend a little over 40 hours to gain 100% completion. The game’s exploration can be fun yet tedious at times, having to travel back and forth during Side Quests and Story Quests- which is just what you expect out of an RPG. The dungeons can keep you guessing since many of them have a ton of different paths to search. Overall, I would say that Revenant Saga is a very good game, and I highly recommend it for sure! Be sure to purchase the add-on content for more relaxed game play. If you’re looking for a challenge, then Revenant Saga is for you! I would like to thank Kemco for all they have done to bring us the vast collection of amazing RPGs. Tons of locations to explore with many resources. The combat system is beautiful. The skills and combos are brilliant! Many treasure chests to discover with tons of great items to collect. The characters are unique and compelling. The Maid association has some hefty challenges with much to offer. Some dungeons are a little too long and often lead you to a dead end- without rewards often. The harder battles can be really tough since you cannot revive a dead transformed character, causing you to restart the battle over and over. Revenant Saga is released on Steam! Anyone else collecting info for Revenant Saga? How do I get this treasure?